HMD Global today announced the Nokia 8.1, a devices that blends high-end design and performance in an affordable package. 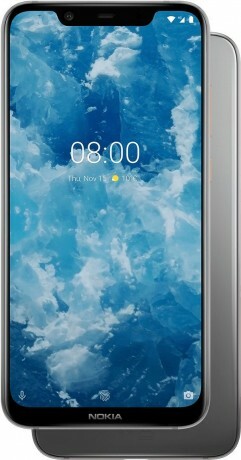 The 8.1 is a metal and glass slab. It features a 6000 series aluminum frame with diamond-cut edges and sandblasted, curved glass panels. The PureDisplay stretches 6.18 inches from corner to corner, and provides full HD+ resolution in a 2:1 aspect ratio. It supports HDR 10 color for improved video playback. HMD Global opted for the Snapdragon 710 processor from Qualcomm with a more powerful multi-core AI Engine. It ships with 4 GB of RAM and 64 GB of storage. A dual-camera system adorns the rear and features a 12-megapixel main sensor and a 13-megapixel secondary sensor with Zeiss optics and optical image stabilization. The Pro Camera mode can tap into the camera's wide aperture for improved low-light shots. The pair can capture portrait/bokeh-style images. A 20-megapixel camera is on front. It supports pixel-binning when shooting in low light and can capture 4K selfie videos. The Nokia 8.1 can use both cameras at the same time to take a "bothie" that can then be dressed up with stickers and other edits. Other features of the Nokia 8.1 include a 3,500mAh battery with fast charging, Bluetooth with aptX, USB-C, 3.5mm headphone jack, and a memory card slot. The 8.1 runs the Android One version of Android 9 Pie, meaning it has a clean user interface and will receive at least two OS-level updates for two years and security updates for three years. The Nokia 8.1 goes on sale in India later this month for approximately $450. HMD Global says it will expand to other markets over time, though it didn't immediately specify which LTE bands the phone supports. HMD Global today announced the Nokia 7.1, a premium mid-range phone that targets people who want an affordable, yet powerful device. The 7.1 adopts the all-screen design approach.